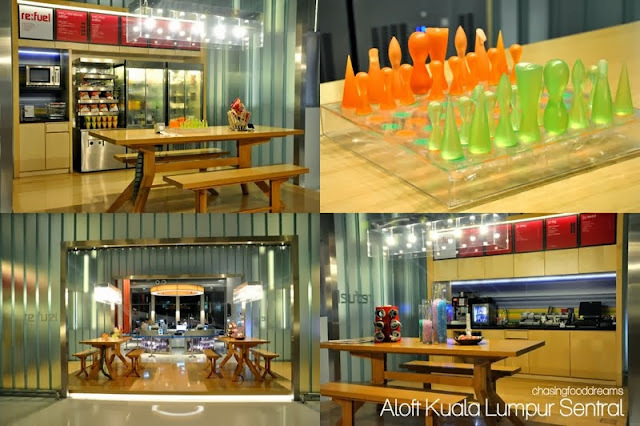 CHASING FOOD DREAMS: Hotel Review Aloft Kuala Lumpur Sentral: Vacationing the Aloft Way! 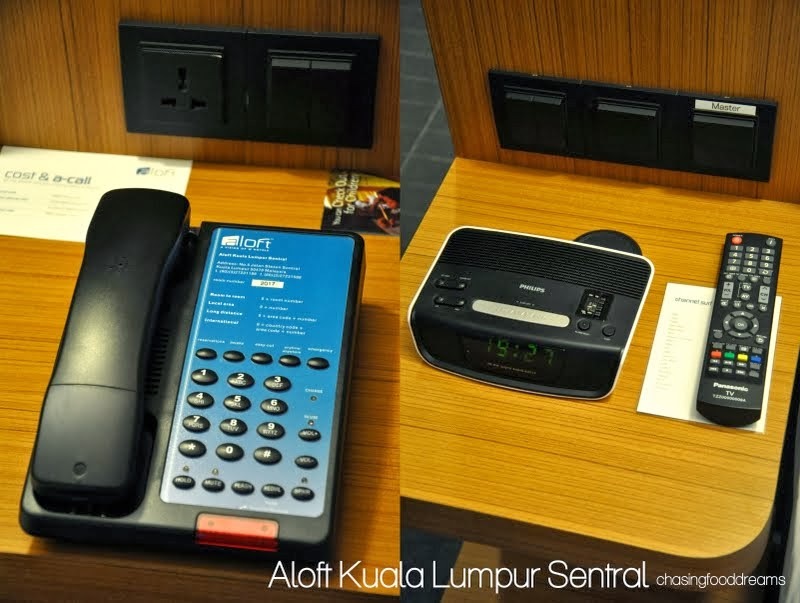 Hotel Review Aloft Kuala Lumpur Sentral: Vacationing the Aloft Way! My 3D/2N Vacation in the City! A vacation doesn’t mean one has to travel to great length to enjoy some tranquility and rest. A recent staycation at Aloft Kuala Lumpur Sentral was enough to convince me and the family that we definitely should do such vacations every once in a while. 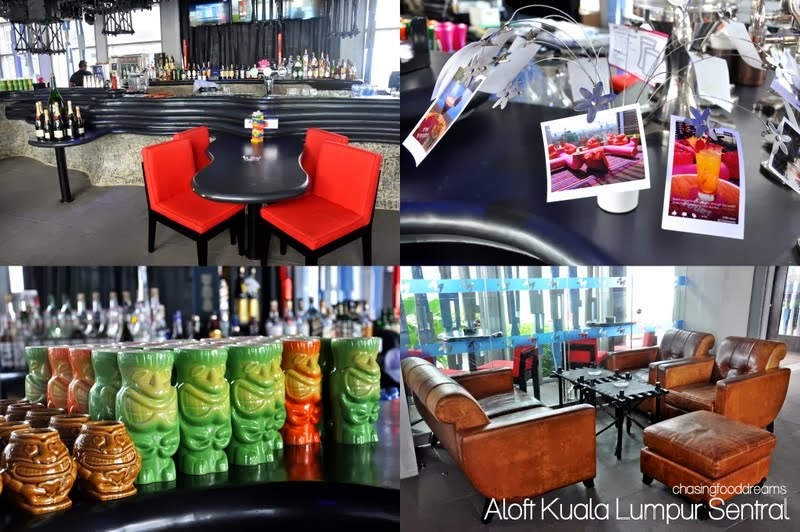 I have been to Aloft Kuala Lumpur Sentral a few times and have always been impress with how different the hotel takes themselves to the edge of modern contemporary experience. 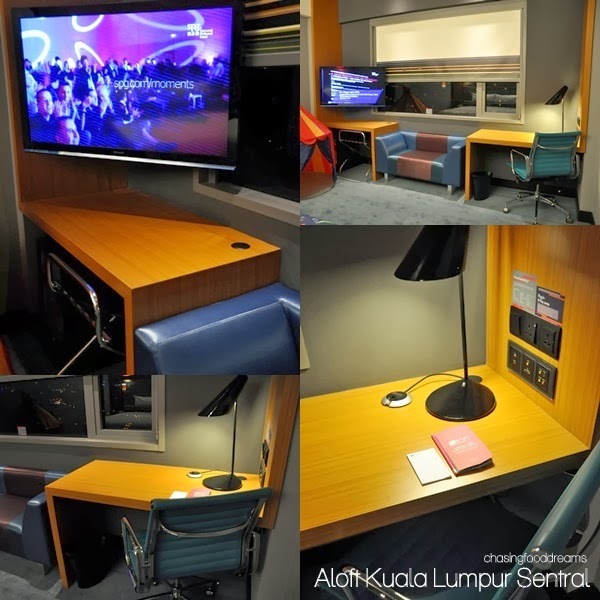 Located in the bustling area of KL Sentral, one may not even need to drive there to play tourist for the weekend since public transportation is easily obtainable for this central spot that aligned major destinations in and out of the city. Braving the Friday traffic, we were excited to spend our weekend at Aloft since it is themed in no like other hotels we have been before. 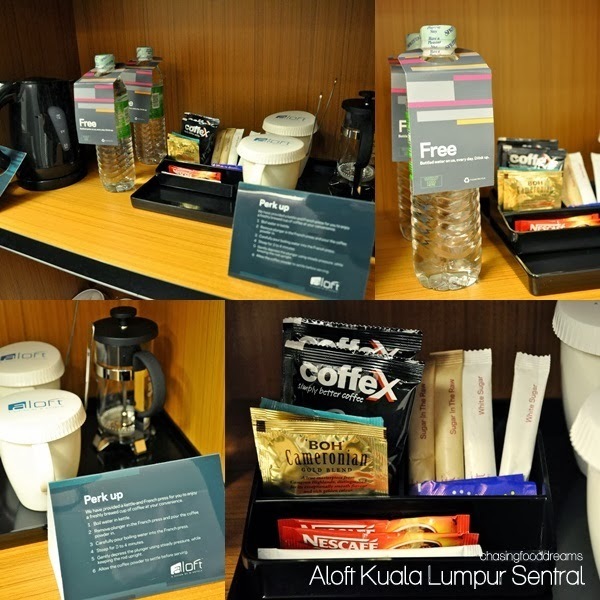 Everything about Aloft is smart casual and service. From the moment we arrived at the open circle designed reception to check in, we were greeted with plenty of smiles and easiness. 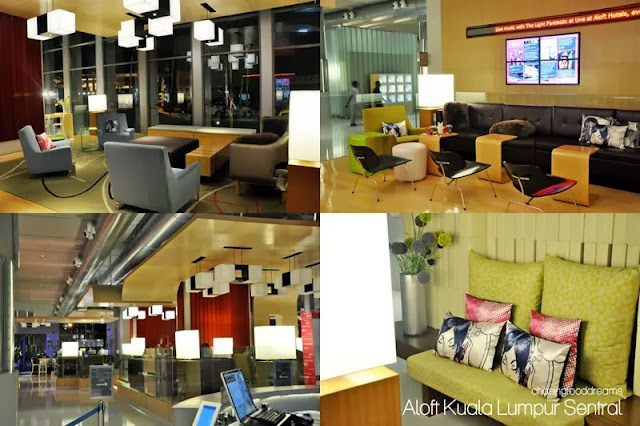 It certainly paved the way for a relaxing openness about Aloft. Our room was spacious and filled up with modern designed themed. A huge king sized bed filled one corner completed with striped bolsters and fluffy soft pillows. The bed is firm enough for comfort while I loved the bolster personally. Sleep was something I really had a lot of during this stay simply because the bed was just so inviting. Over the headboard, a bright pink poster with a quirky comical graphic of information confirmed to us that Aloft is going to be unique in its own hotel and management way. Apparently each room has its own unique poster! I really must commend the designer for the overall interior design as it optimized as much space for pure comfort. Facing the bed, everything from desk to wall mounted 42” television to a retro blue sofa and fridge was all arranged in a row facing the windows. It makes everything easy at a glance and offers more space all around. The television is adjustable at angles while a mini fridge sits empty beneath it. One can fill up the fridge from the REFUEL bar below at the lobby. The work desk next to it had everyone one needs to work. Coincidentally, I had to work that weekend for some hours and it was easy peasy since the internet network was great. Wireless or cable was available and so was charging sockets. A modern black lamp added the contemporary touch. My room view was lovely in the evening as one can see miles of city lights gleaming everywhere. Bathroom was also spacious and well designed with a large wall of cabinets on one side and the other with a shower cubicle and toilet cubicle. The dresser with a large glass mirror separates the room at the end. 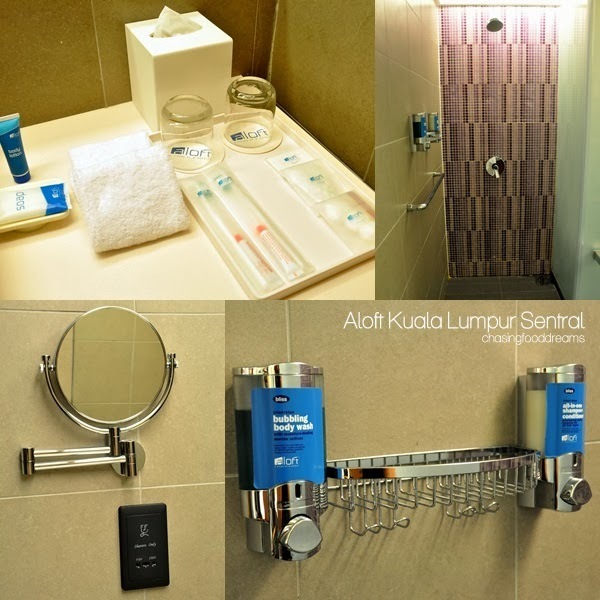 Bathroom amenities have the standard soap, toothbrush, body lotion, shower cap and more. The cabinets were cleverly designed to fit a safe, the usual array of drinks and kettle with the additional element of French press for guests to enjoy a lovely brew. It comes completed with instructions too. The small touches of reminders to drink up the free bottle waters, how to use the items and more, scores another point for great effort. Room slippers, hair dryer and ironing board are also available. Thick fluffy bathrobes together with a recycled bag are available to guests during their stay. Aloft is a smoke free hotel and I am definitely a great supporter in this one since I had always had issues with sleeping in room that smells of smoke! We headed downstairs to hotel’s all-day dining restaurant Nook for our meal. No newbie at Nook, I have had the pleasure of dining there on several occasions already. Check them out here, here and here. We were hungry and opted for buffet that night. 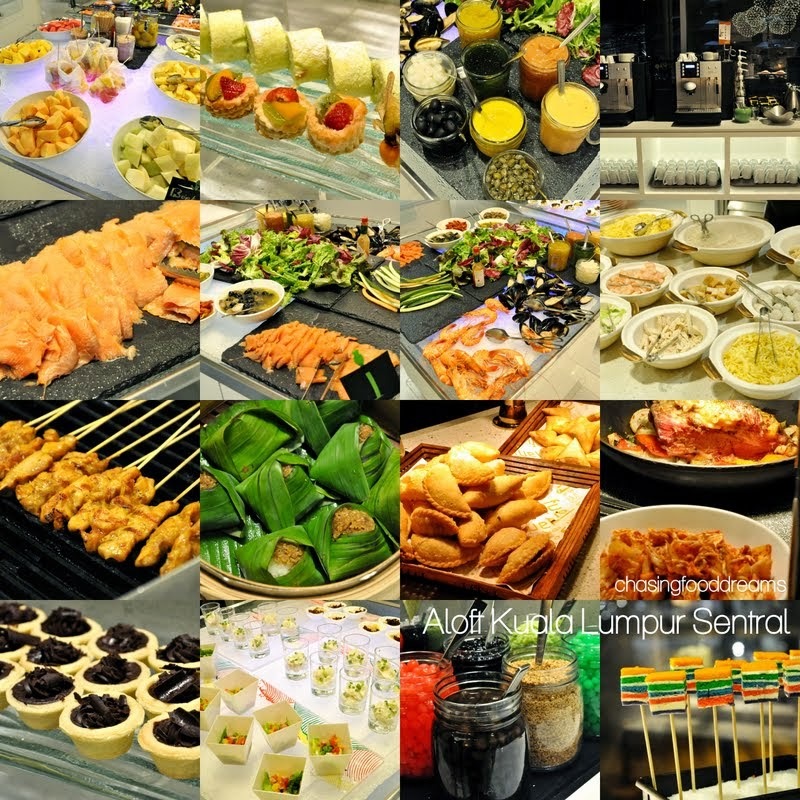 Buffet dinner is priced at RM78++ per person. Dishes are served on individually lite neon stations while the main 360 degree buffet counter holds majority of the hot dishes. Globes of lights strung above the buffet counter, letting guests admire the glittery star light suspended in cleverly in thin air. Nook’s signatures are their Sarawak Laksa, a must-have for all. We even had a few Sarawakians attesting that Nook’s Sarawak Laksa is superb! Though choices are not as many as other hotels, it is sufficient as I really enjoyed most of the international and local dishes in the buffet. My bowl of Sarawak Laksa was truly delicious that night while the satay and the kimchi salted beef were the other favorites that night. After dinner, took a leisure stroll around the hotel. We checked out REFUEL, a self-service grab and go café, and saw snacks, gourmet sandwiches, pastries and bread with a neat list of beverages. Facing next to REFUEL, guests have access to free internet surfing on MAC computers or simply get some fun with the free Wii machine. My son sure had fun dancing to the Wii machine that night! Moving on, there is a REMIX lounge where guests are able to enjoy some rest in the contemporary eclectic mix of furniture. There is a phone charger station too with many of the familiar brand phones for those who seek some emergency charging moments. The next day, breakfast was served at Nook. We really enjoyed all our breakfasts at the restaurant. There is plenty of Western and local breakfast delights from sausages to eggs to congee, nasi lemak and even my favorite Sarawak Laksa. Yes, I had another bowl of the laksa at both breakfast. 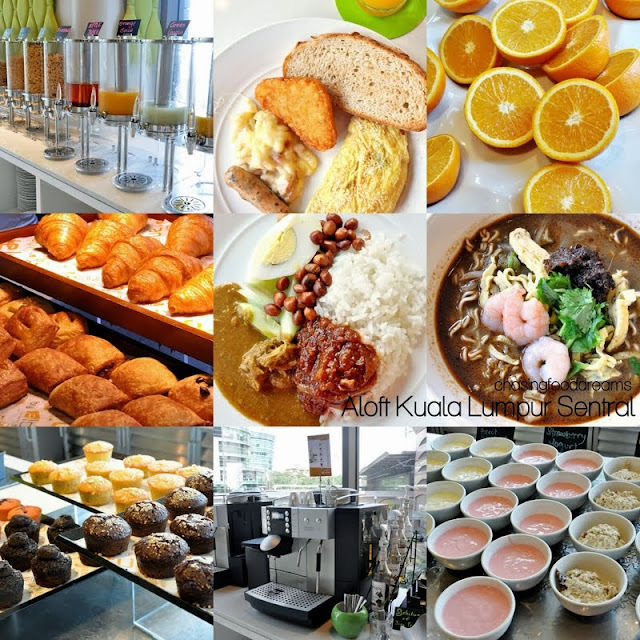 Juices, yoghurt, cereals, pastries and muffins, coffee and tea are self-service. Kudos to Nook for the citrus press as guest helps themselves to freshly squeeze orange juice. We headed back to the room for a good rest while I worked. Then we head out for a walk to check out the Mai Bar and W XYZ Bar in the afternoon. 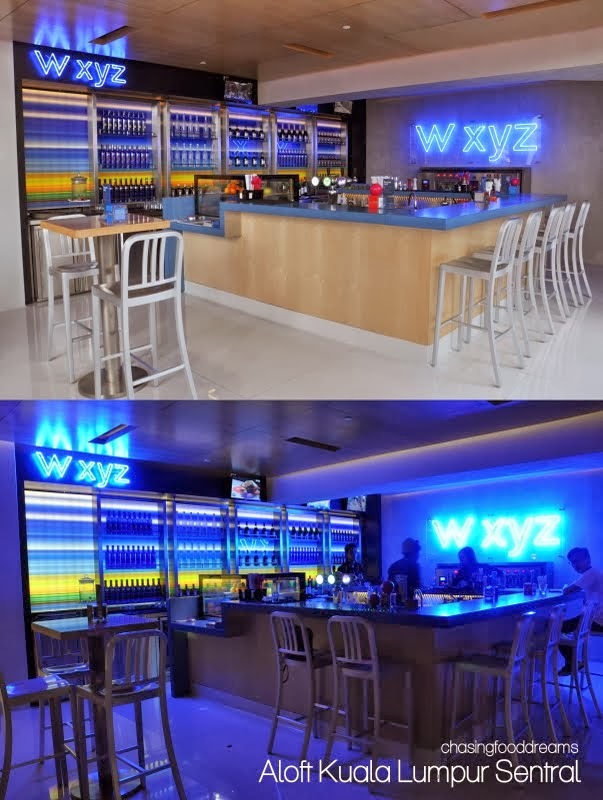 W XYZ Bar is Aloft’s signature bar all over the world. Designed with minimalist, guests can enjoy some leisure moments of games, drinks, snacks during the day while live bands belts out songs in the evening for guests while sipping cocktails. At night, the bar features neon blue lights for a groovy themed. The Mai Bar, a Tiki themed bar, sits on the rooftop of Aloft. During the day, one can see the eclectic mix of furniture and curvy bar, tiki themed paintings and more. As the sun sets, Mai Bar turns groovy and upbeat with its lavalicious bar lite up with LED lights. Live bands and DJs pumps up the adrenalin to get the party going at night. We didn’t have our cocktails since we had the little one with us during the stay. 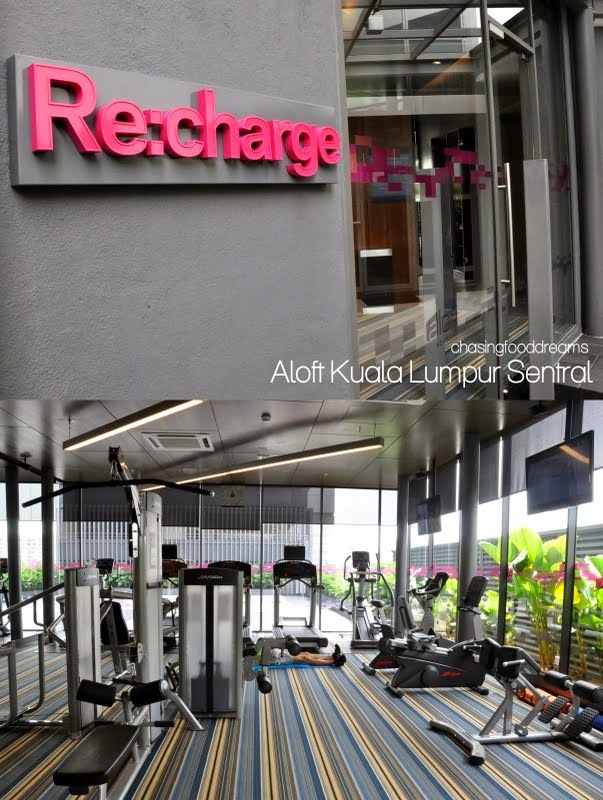 If you simply need to get fit even when you are on vacation, check out RECHARGE for some gym actions. I checked out the ballroom curiously since I saw many people were scurrying around that floor. There was a coming event in the evening and the Grand Ballroom, an astonishing 840 capacity, was decked out in purple theme throughout. Love the chandeliers! My little one and I had a late lunch since my other half was not around. As a rainy weather was approaching, we decided to head back to Nook for lunch. We had a la carte orders where he had breakfast Pancakes (RM12) with sausages and I had the local Nasi Goreng (RM28). My son polished off his happily while I enjoyed my spicy fried rice served with large prawns and a juicy fried chicken. After the rain, I took my little one for a dip at SPLASH located at the rooftop next to Mai Bar. It was a grey evening but my little one did get some short moments enjoying the infinity pool overlooking the city. We returned the next morning for more splashes and fun. Throughout our stay, blue skies were not in our favor but we still enjoyed the pool very much. Oh, I almost forgot, we got free ice creams handed out to us at the pool… a lovely surprise! Dinner time and we went a la carte again. We shared a Bucket of Seafood (RM20) and a superb Tomato Bisque. I had a really delicious spicy Oglio Aglio (RM41) featuring two huge grilled tiger prawns while other half had Braised Prawn Noodles (RM43), a braised Yee Mee noodles topped with jumbo tiger prawns in an eggy broth. Little one just had a plain noodle soup from the buffet. 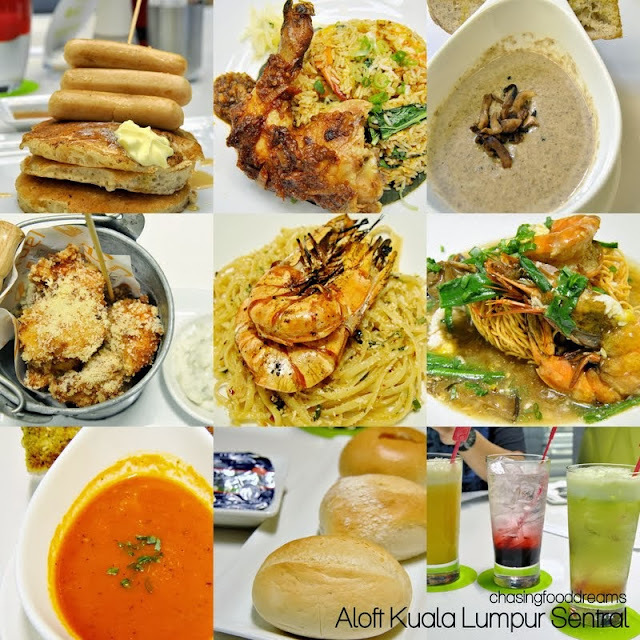 Nook’s local dishes are truly yummy so make sure to check it out. 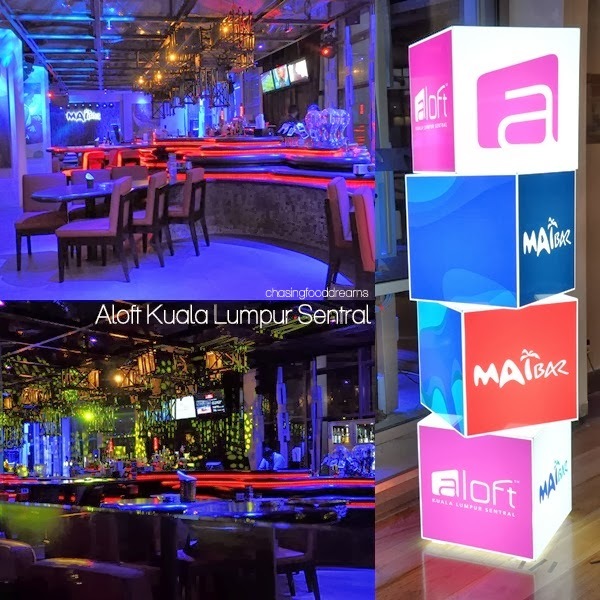 If you have really enjoyed my post and wish to experience this, there is a contest right now that may win you a 3D/2N experience at Aloft Kuala Lumpur Sentral! 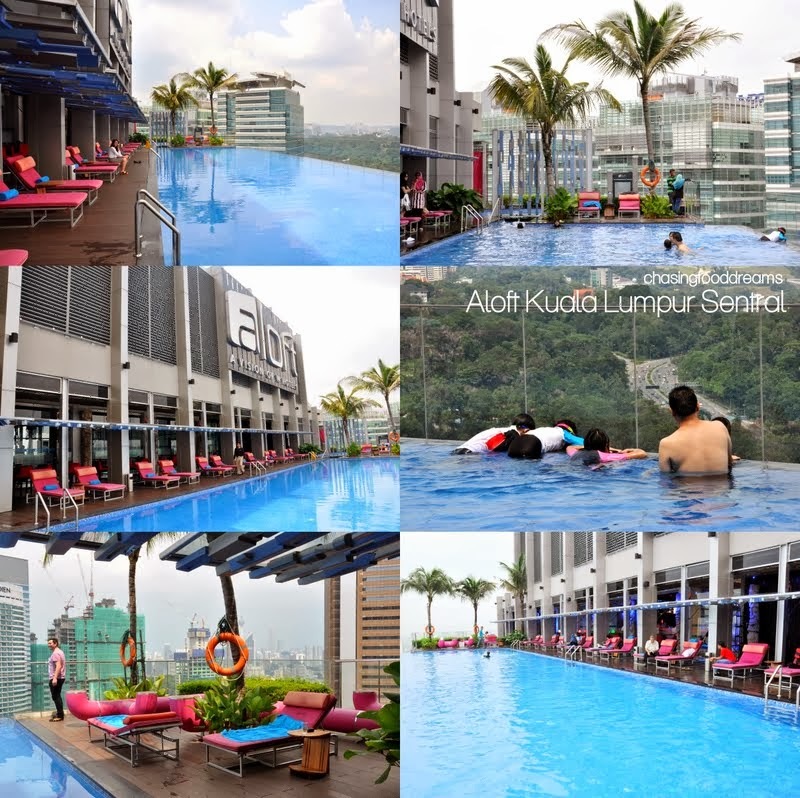 3 Photos with the Highest Votes wins a 3D/2N staycation at ALOFT KUALA LUMPUR SENTRAL! It comes with my tagline, and so, I am quite predictable to say that I am always Chasing Food Dreams, even when I am in the office! What’s your de-stressing solution? Wow! Awesome room man! The pool looks great either! Aiyo... Were you attempting to gain weight or de-stress Jennifer? LOL! My kids enjoyed their stay in this hotel too.. so much to do there!